Turbo Booking It's raining festivals! 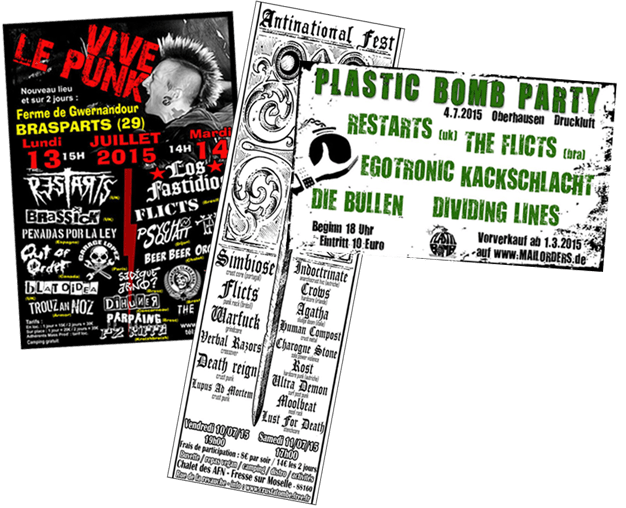 The Restarts​ and the Flicts​ will play at the Plastic Bomb Party in Oberhausen and the Vive Le Punk festival in Brasparts! The Flicts will also play at the Antinational Fest in Fresse sur Moselle! UK – Blackpool, Rebellion Festival: Restarts, Besserbitch, Pete Bentham & The Dinner Ladies and Subhumans! DE – Bremen, Schlachthof, B.O.B. Fest: The Restarts and the Subhumans! UK – Winchester, Boomtown Festival: The Restarts and the Subhumans! CZ – Vyškov, Pod Parou festival: Subhumans! LV – Ratnieki, Laba Daba festival: Subhumans! FR – Maignelay Montigny, Summer Party Festival: Not Scientists! UK – Newcastle, North East Calling: Subhumans! US – Orlando, FL, What’sit Records – Punk Fiesta: Room Full Of Strangers! SE – Rejmyre, Skogsröjet festival: Besserbitch! US – Appleton, WI, Mile Of Music Festival: The Ghost Wolves! ES – Vidreres, Actitud Festival: Not Scientists! SE – Gävle, Getaway Rock festival: Besserbitch! FR – Lès Remiremont, Les Sapins Barbus Festival: Not Scientists! US – Ybor City, FL, Big Pre Fest: Not Scientists! US – Gainesville, FL, THE FEST: Not Scientists! UK – Salford, Kings Arms Festival: Pete Bentham & The Dinner Ladies! UK – Penzance, Three Chord Fest: The Restarts!